A GOVERNMENT minister apologised after being forced to admit that more than 12 times as much public money was handed to Highlands-based arms firms than was previously stated. Keith Brown MSP wrongly said last year in his then-role as economy secretary that just £61,238 had been given to the arms trade by Highlands and Islands Enterprise (HIE), when in fact £740,000 of public money was awarded to various companies. 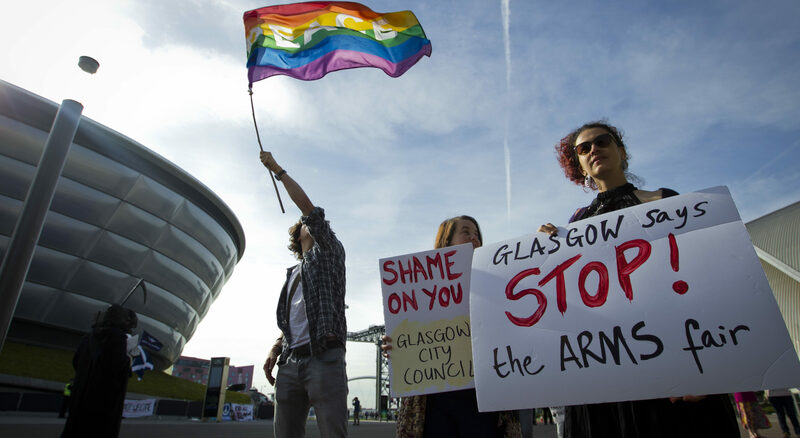 The amount of funding to the arms sector in the Highlands was revealed after the Scottish Greens appealed to the information commissioner over the time taken by the Scottish Government to respond to a Freedom of Information request. The government now admits that, when combined with Scottish Enterprise money, it spent £1.2m on supporting the arms trade in 2016-17 alone, close to twice the figure originally stated. The error was blamed on “inaccurate information which was provided by HIE to the Scottish Government” for use in answering a question by Ross Greer MSP. In a letter, Brown wrote to Greer: “I am writing to advise you that I have provided an amended answer to the PQ to Parliament and to apologise for the error. The chief executive of Highlands and Islands Enterprise, Charlotte Wright also wrote a letter of apology to Greer. Arms companies in the Highlands who received taxpayers’ money included the now-defunct Scotland Electronics (International) which was based in Moray. The firm made products for military radar, bomb disposal robots, stealth submarines used by UK special forces, rocket launcher controls and gun stabilisation systems for the Type 42 destroyer. Its customers included arms giants such as BAE Systems, Lockheed Martin and Northrop Grumman. The firm went into liquidation last year after receiving more than £1.2m of taxpayers’ money between 2007 and 2016. Copernicus Technology Limited, based in Elgin, received £117,459 in 2016/17. The firm has been handed more than £500,000 since 2009 and makes products for the Eurofighter jet and RAF Tornados. Another recipient of public money was Denchi Power Ltd which makes batteries for military drones. The firm has applied for licences to export products to Israel, Qatar, Turkey and Pakistan. Greer, the West of Scotland’s Green MSP, said: “It’s just astounding that so much public money is being given to an industry which creates death and destruction across the world, all in the name of profit. “For Highlands and Islands Enterprise alone to be handing out three quarters of a million pounds in one year is unacceptable, particularly when there are so many deserving social enterprises and small businesses who would have benefited from that support. Between this and the spectacle of SNP-run Glasgow City Council supporting an arms fair at the SEC, it’s clear that the SNP has greater ties to the arms industry than party bosses like to make out. A Scottish Government spokesperson said: “The Scottish Government and its enterprise agencies do not provide funding for the manufacture of munitions. “We are very clear that we expect the UK Government to properly police the export of arms and investigate whenever concerns are raised.